When a natural tooth becomes chipped or fractured, the consequences can go far beyond simply being an eyesore. Significant pain may occur as well, especially when enjoying overly chewy foods. Your natural bite could also become dangerously unbalanced because the top and bottom rows of teeth no longer fit together properly. In order to rebuild what’s been lost, Dr. Albert, Dr. Snow, and Dr. Stylski strongly recommend a new porcelain crown. This restorative service helps to not only protect the damaged tooth but also bring back its natural shape and appearance. 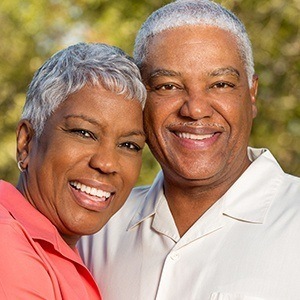 Please contact Atrium Family Dental if you’d like to schedule an appointment here in New Lenox, IL and learn whether or not a new crown could be right for you. 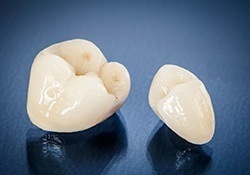 A porcelain dental crown (also sometimes referred to as a “cap”) is essentially a custom, tooth-shaped covering that is placed over the visible surfaces of a natural tooth. Once situated, it should be virtually undetectable when compared to the rest of a patient’s smile. While crowns are most commonly recommended to rejuvenate and support single teeth, they have other uses as well. 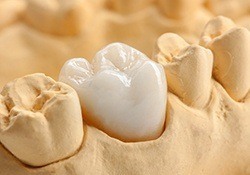 Our dentists may recommend them for anchoring a traditional dental bridge in place or covering placed dental implants. In most cases, the creation and placement of a brand-new porcelain crown requires at least two appointments here at Atrium Family Dental. First, any decayed portions of the dental structure will be carefully removed, and the tooth will be reshaped to accommodate the new addition. Impressions are then captured and sent to a trusted dental laboratory. Your brand-new porcelain crown will be beautifully customized to match the surrounding teeth in every way, from their color to their size to their overall shape. During this process, a temporary crown will be provided so that patients can continue to eat and speak normally without any disruptions to their daily routine. The brand-new crown will typically be ready in just a couple of weeks. Once our dentists receive it from the lab, we will invite the patient back into the office and securely bond it into place while making any final adjustments. The surface will also be comprehensively buffed and polished so that it feels just like natural tooth enamel, and we will take the time to make sure it fits well within your natural bite too. Porcelain crowns come with several long-lasting benefits. Because they’re crafted from high-quality ceramic materials, their durability is surprisingly strong, allowing for normal chewing (although we do recommend that patients avoid extremely sticky and hard foods). The metal-free nature of the restoration is also highly pleasing from an aesthetic standpoint – it will blend in beautifully with the rest of your smile. The placement of a new dental crown can successfully rescue natural teeth that would otherwise need to be extracted and replaced. This procedure is much less invasive, and your continuing oral health will benefit as well. What are the Risks of Porcelain Dental Crowns? There is very little risk involved when undergoing the placement of a porcelain crown with experienced dentists like Dr. Albert, Dr. Snow, and Dr. Stylski. Patients may experience some slight sensitivity to overly hot or cold foods, and there is a chance that your bite could be negatively affected by the new addition. If this is the case, we will take the time to modify the crown so that the upper and lower rows of teeth fit together smoothly once more. Over time, a porcelain crown may start to shift out of place or become dislodged. If you notice signs of this occurring, please let the Atrium Family Dental team know right away so that we can perform repairs or provide a replacement. We look forward to welcoming new patients in for a restorative consultation soon. Don’t hesitate to contact our New Lenox, IL practice about ways to renew and revitalize your one-of-a-kind smile!